Sequential’s massive sale has a little while left to run, so if you were going to pick anything up, now is most definitely the time. But the problem with a sale like that is obvious. What do you grab? Do you go with old favorites in a shiny new digital format or do you try something new? I tried several new things and enjoyed every single one. Here’s the first. In 1814, the story goes, a French warship sunk off the coast of Hartlepool. The following morning, locals discovered a survivor who they interrogated, put on trial and executed. It was only after this that they realized what had happened. The ‘Frenchman’, was in fact a monkey, a ship’s mascot. Horrified by what they’d put an innocent animal through, the town erected a statue in its honor and have continued to remember the Hartlepool Monkey all the way up to the rpesent day. It’s one of those stories that might not be true but is so powerful and perfectly formed it might as well be. It’s also the basis for ‘The Hartlepool Monkey’, published by Knockabout and available in the Sequential sale. 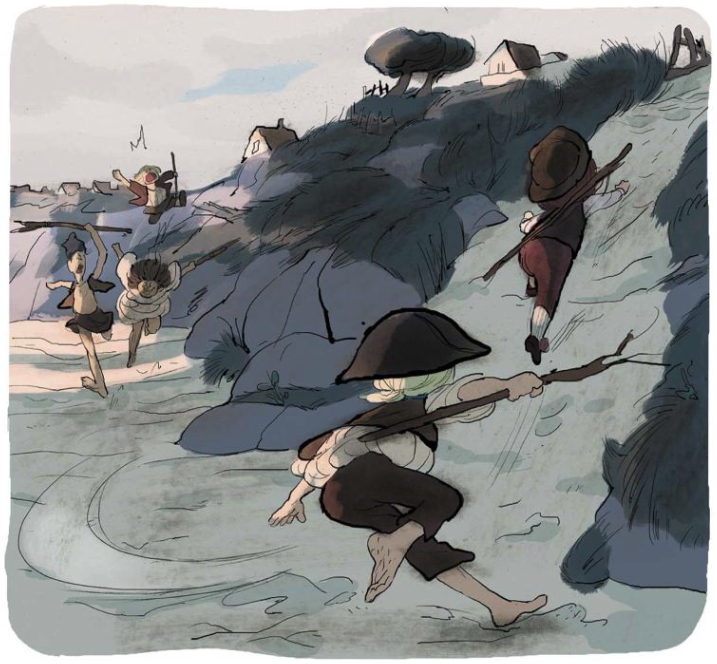 Written by Wilfrid Lupano with art by Jérémie Moreau it takes the basics of the story and approaches it from multiple angles. The first is that of the crew, from the point of view of both the monkey and Philip, the cabin boy and only other survivor. The monkey’s role is, initially, comic relief but quickly becomes that of a victim. Moreau continually puts us inside his head, making it clear he’s intelligent enough to understand a lot of what’s going on. At first that’s funny, and the monkey’s laconic, long-suffering expressions are a neat contrast to the increasingly frantic townsfolk. But as the book closes, the monkey recedes into the background. The story is more important than the truth and as a result the monkey becomes the only thing he ever could be; a victim. Philip is a lot luckier. Lupano has talked a lot about how the book is structured to look at two different age groups and Philip, along with Charlie, the son of a visiting Doctor, is our primary focus for the younger generation. He’s clearly horrified by his experience but he’s also a gentle, kind boy jumping at the chance to be a child instead of a soldier. His journey is the light counterpoint to the monkey’s, one that moves away from the demented jingoism of the war and into something which will be difficult but infinitely less terrifying. The next perspective both skews upwards and is split in two. The townsfolk, who Moreau renders with the sort of hairy abandon that would normally be reserved for the monkey, are a fascinating and troubling cast of characters. Lupano’s script walks a fine line between charicature, comedy and horror, touching all three when needed and always doing so through the townsfolk. Where the children can view the war as a game, the adults view it as a weather system. Always on the horizon, always there and never quite breaking. They live in a time of constant stress and uncertainty and in many ways are tragic figures. They’re willingness to accept the monkey is a Frenchman, and inability to see any other possibility, shows just how insular they are. The few voices willing to entertain the possibility they might be wrong are shouted down and instead a small town that’s used to being powerless pushes back far harder than it should against an innocent animal. The closing scenes, where they both realize what they’ve done and reassure themselves it was understandable are arguably the book’s largest punch to the gut. These are people who’ve done something awful, realized that they have and instantly forgiven themselves. They’re us, and we’re them, endlessly shouting for a head, not caring if it’s a human one. The final scenes of the trial are horrific; Moreau soaking the pages in the dark oranges and blacks of pure bloodlust as the townsfolk become more bestial than their innocent victim. There’s also a subtle, but meaningful look at the class divide in the UK. Charlie’s father, educated and from out of town, is disgusted at the townsfolk’s barbarity and is instrumental in helping Philip and Melody Patterson, the granddaughter of the town’s one veteran. The message is clear; the only way to learn is to leave. The townsfolk have no intention of doing so, but Philip, Melody, Charlie and his father can’t get out of town fast enough. 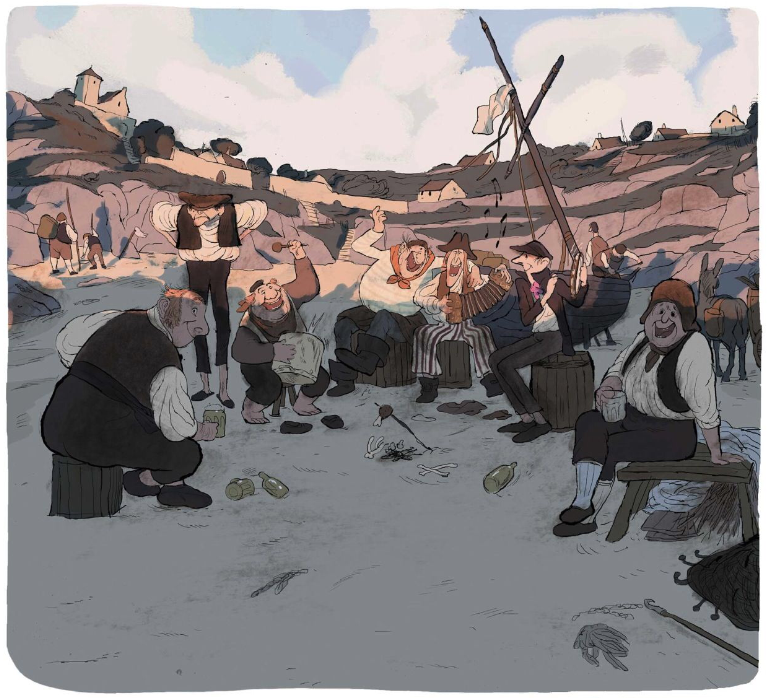 The Hartlepool Monkey is one of the most assured, measured graphic novels I’ve read this year and it’s one where each member of the creative team is vital. Lupano’s excellent script juggles tone and theme with ease and manages to talk about the horrors of war without ever devolving into cheap opera. Instead it’s an absurd, tragic, occasionally hilarious story about how we cling to our misconceptions and what happens when we do. Moreau’s art is staggering. There’s a peculiar palette of colours that the British coast has and, having grown up in a seaside community, I felt right at home from page one. The weather becomes an emotional barometer, the sunshine always cut by clouds, a storm always on the horizon. It’s beautiful work that pulls no punches and vibrates with constant motion. Look at this incredible panel from the game the children play, the motion encoded into it, the sense of perspective and depth and place. The entire book is like that. And the entire book is unmissable. A blisteringly clever, angry dissection of nationalism, a tragically realistic exploration of a probable myth, a comedy, a tragedy and a horror story all rolled into one. It’s a great story and, like the very best ones, doesn’t need to be true to hit home. 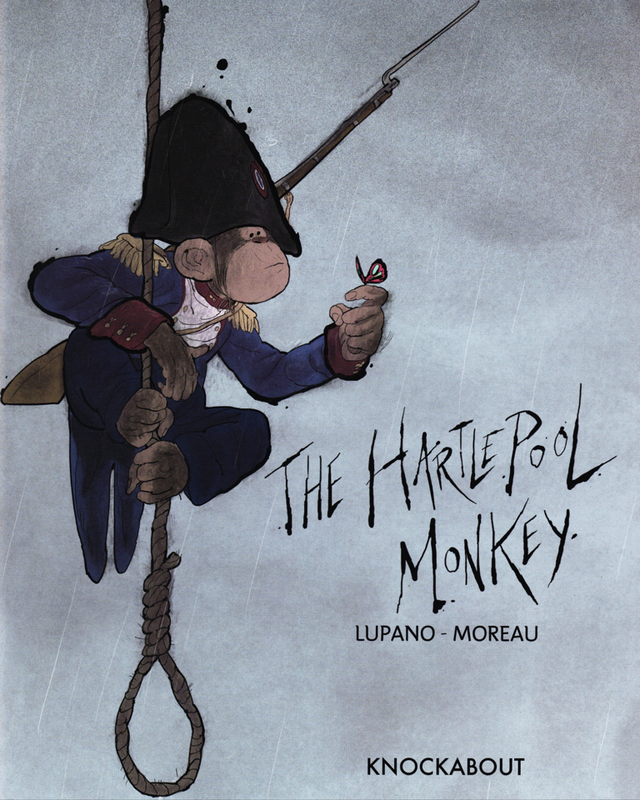 The Hartlepool Monkey is available now from Sequential for a frankly ridiculously good price. Go get it. And once you have read this commentary from the creators.